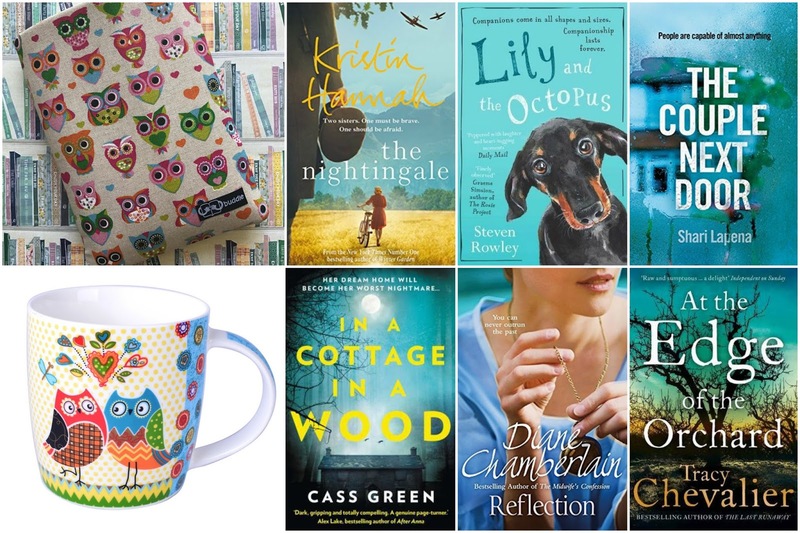 Enter this giveaway for a chance to win six books and an owl Book Buddle and mug. Good luck! I love reading about dogs because I love them and find them so fascinating. I have a beautiful Labrador. Dogs because they are beautiful, intelligent creatures. Dogs as I have one now and grew up with dogs! Definitely dogs - they are man's best friend after all and I love it when they are smarter than a protoganist (well, the bad guys). I love Dragons! Those count as animals right? Love dogs as they are the perfect companion. Love the bond between the owner and the dog. Horses, I've always loved horses and would have loved to have one and learn to ride too. Do mythical creatures like a phoenix or hippogriff count? If so then because I obviously love anything magical or mythological related. It's so fascinating! Horses, there's just something magical and majestic about them. There's nothing more amazing than cantering along the beach, I feel wild & free!!! I think horses and dogs are pretty even for me because they are so intelligent. There a beauty about horses that I just love. I love reading about dogs. I've always had at least one in my family and they are loyal and loving members! "What's your favorite kind of animal to read about and why?" Anything with cats is great! I'm not a big pet person in real life either so I don't really care what kind of animal is in the books. I mean I like animals as long as I don't have to take them home. My passion in life (apart from men!) is birds. I get very emotional when I read about interactions and the relationships people have with birds. I like horses because they are so elegant! Anything that puts me in Africa! I love reading about horses because they are so useful! For real critters I love dogs, for fantasy critters, I love dragons. I guess I'd say dogs would be the animal I like to read about. I don't really read about animals that much though. Dogs. I find them fascinating animals. I have my own 2 and it's amazing how they interact with you and how it varies depending on your own mood. Their stories ate often amazing. Cats and dogs. I just love them. <3 I also have cats and dogs, so maybe that's why, lol. I am THE biggest owl-lover. Apart from the fact that they look beautiful, I am fortunate to live near the rare breeds farm that has all different breeds of owls including miniature ones. At Least twice a year I visit this lovely farm with my family. They organise open days where you can find out more about their animals; kids love feeding the animals and having fun. I find owls the most fascinating creatures in the animal kingdom as, there are always new, interesting things to learn about them. Wolves, because they are my favorite animals. Dogs. They are my fav animals and also very smart. They can be a bit wicked in stories and I love that. Dogs or horses as I'm a dog lover (I own an Old English Sheepdog) and I also used to ride horses when I was younger and find them fascinating. I love cats as they can get up to so mischief! Dogs, and owls and other animals as well. I consider my self a nature lover and that includes animals. Cats and if mythical beings are included dragons! Dogs! And foxes, mainly because they remind me of my own dog, hahaha. I love to read about cats and dogs as I love them so much. Cats & dogs. They make great characters & bring so much to a story. It can be any animal, depends on how good the author builds the character. Happy weekend! I love reading about horses - they're like another human charater! I like to read books with exotic animals because there is always a description of a beautiful jungle or something. I enjoyed Leopard at the Door for that reason. I love reading about dogs, but also about farm animals or horses. It's because I like reading books set in country.